Cruising through the scenic views of water cascading down the Benton Mackaye Trail is the road to the cabin. Cherry Log Mountain beholds a hiking on the trail right out the front door! This seriously charming very private 2 bedroom 1 bath cabin is so comfortable and pleasant to be in, whether for a couple nights or an extended stay. The full kitchen has all the amenities you'll need to make delicious meals or you can grill on the wrap around deck w 2 ceiling fans.The master bedroom has a queen bed that is sure to offer a restful night's sleep. The 2nd bedroom has a comfy daybed and a twin mattress in addition.There's a stack able W/D , full bathroom, 3 TV's, reclining chair, & a comfortable sofa, in front of the wood burning F/P, and a wonderful downstairs, with a sectional sofa, bar, microwave, small fridge, and plenty of room to spread out. Also a chimnea on the deck to roast Hot Dogs or S'mores .There's several paths to hike around with water cascading off rocks , it's quite lovely. Just 7 miles from Downtown Blue Ridge and 7 miles from Ellijay, there are loads of restaurants , White water rafting , tubing, shopping, bowling, Putt Putt, or even helicoptor rides! Kayaking and 2 Wineries are within 8 miles. Go zip lining, horseback riding, visit Mercier Orchards all only a few miles! Lake Blue Ridge is close by where you can rent jet skis boats, paddle boards. The Toccoa River, where the 1996 Olympics were held, is 8.4 miles and so worth the 25 minute drive to enjoy white water rafting ,hiking, and walk on the swinging bridge, it truly is spectacular! The upper Toccoa River is a relaxing 2 hour tube ride and ideal for the young one's, Expedition Big Foot Museum is a new site in Blue Ridge and it's almost next door to the cabin, a wonderful family outing. Harrah's casino is in Morganton and right at a 45 minute drive for some night life. I grew up in Atlanta, loved living in Georgia for the taste of the 4 seasons! Fall being my favorite always I enjoyed going to the mountains , and it wasn't more than a 2 hr drive.Tried to move away a few times, but kept coming back home. Growing up I was active in a variety of sports. Playing tennis, hiking, kayaking, reading, playing with my pups is how I like to spend my time. I also have my real estate license, which I enjoy so much. , The privacy, mountain views, and a slight water view almost sealed the deal. However, the Blue Ridge Scenic train passes under/beside our home every so often. This combination of scenery, peace, and is what we've been enjoying for 11 years now, and we'd like to share it with others. Located on the Benton Mackaye Trail, Charming Covered Bridges throughout, Fishing Pond open to the public, The home's charm of being a real Log Cabin. 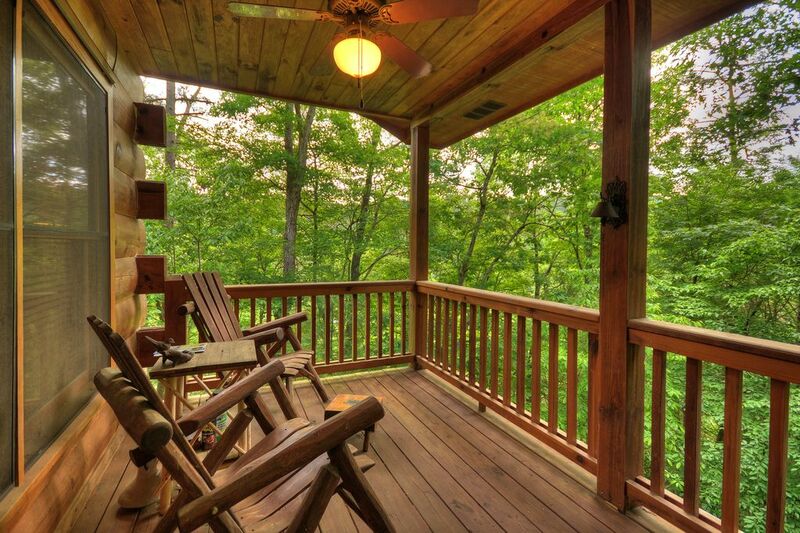 Lovely wrap around deck, great for morning coffee while taking in the view, or anytime. The cabin was nice and cozy. It was clean upon arrival and Carlyn left us a wonderful welcome basket with some treats and information about the area. 10/10 would visit again. It was a pleasure having you both, and your fur babies. Thanks for coming, and we're thrilled you all had such a good time! We have stayed at this cabin twice now & love it!! It has everything we have needed plus lots of little extras. It is close to hiking areas & lots of activities in Blue Ridge. We will definitely be back again!! A nicely appointed cabin with a lower "fun and game" room. The main level is very well furnished and has all the things to make a stay quite enjoyable and economical by taking meals at the cabin when you are too worn out from recreating all day to go out again for a sit down meal. The owner adds nice "personal touches" to your arrival; for us there were extra towels furnished for the two dogs we had with us and a bowl of water at the entry door on the balcony. Inside were some special doggy treats. We had a great time. Everything was beyond our expectations! Owner was very accommodating and easy to stay in contact with. Beautiful location and all amenities were above and beyond. We highly recommend and plan to return again! Awesome spot - we’ll be back! Our first time in Blue Ridge... so much fun to be had! Hiking, zip-line tours and horseback riding, along with some really great restaurants. The cabin is AWESOME!! Hiking trails right off the driveway and Carlyn (owner) was great to work with. HIGHLY RECOMMEND!! Clean location with great privacy, Full with everything you may forget. A few miles from restaurants, apple orchard and other attractions. Owner available and extremely helpful . You'll enjoy the scenic cascading waters driving up to the cabin through the Benton Mackaye Trail. You can start your hike to the trail right outside the door, and you will be pleasantly surprised for a 20 minute to an hour long adventure .The cabin is just 7 miles from Downtown Blue Ridge, with a host of choices whether it's water skiing, shopping, zip lining, horse back riding, wineries, white water rafting, drive-in movie theater, live theater, or tubing.There are many Great restaurants, and you can visit Mercier Orchards only 10 miles away. We like to kayak at the Blue Ridge Mountain Kayaking center for the 3 hour beautiful scenic ride. The water is crystal clear and you can fish as well. Also, the Toccoa River is around 12 miles from the cabin, this is where they had the 1996 Olympics for rafting. It's a beautiful area to hike on the huge rocks, go rafting, tubing, and the swinging bridge is so much fun. We like to bring our pups, as they enjoy being in and around the water. You can sit on the rocks and watch the rafters for hours! There are many hiking trails we have traveled through around the area that are terrific. Several grocery stores within 5-7 miles from the cabin.